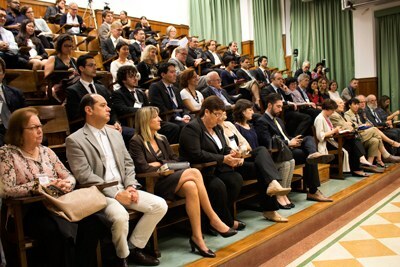 The opening session of the Intercontinental Academia (ICA), which took place on the evening of April 17 at USP’s Medical School, was marked by the enthusiasm of all those present for the uniqueness of the project and its importance for scientific and cultural cooperation between scholars from different countries, institutions and fields of knowledge. The president of the National Council for Scientific and Technological Development (CNPq), Hernan Chaimovich, who is also a member of IEA’s Scientific Committee, said that the ICA is an example of “non canonical” activity that must play a greater role in the training of scholars: “The choice of one subject to be analyzed by people from different cultures and backgrounds has an extremely rich intellectual relevance; it is an example of how to overcome interdisciplinarity and achieve an academically competitive transculturality anywhere in the world.” Chaimovich also stressed the quality of the scientific profile of the young scholars selected for the project. 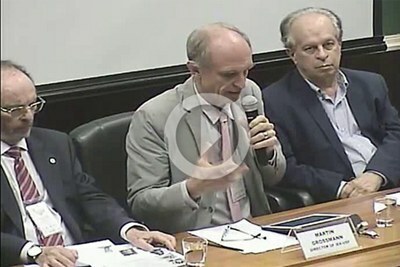 The director of the IEA, Martin Grossmann, presented the history and characteristics of the project, explaining that side by side with reflections on the concepts of time in various sciences, other activities and discussion topics were also included, such as a discussion on the future of the university and the development of a MOOC (Massive Open Online Course), a free course about time to be offered via the Web. Carsten Dose, from the Institute of Advanced Studies of the University of Freiburg (Germany), general secretary of the project, congratulated all participants on behalf of all the institutes for advanced study that comprise the Ubias network (University-Based Institutes for Advanced Study), ICA’s mother organization. He said the materialization of the proposal that emerged in 2012 is a clear demonstration of how Ubias’ member institutes can work together. Dose also paid tribute to the former director of the IEA, César Ades (1943-2012), who attended the meeting that established Ubias in October 2010 and impressed everyone with his enthusiasm for the new entity. Dapeng Cai, from the Institute for Advanced Research (IAR) at Nagoya University (Japan), a partner of the IEA in the implementation of the ICA, highlighted the efforts to bring about this project and the importance of the final product being a MOOC about time. In his view, the creation of a MOOC shows that the ICA, in addition to enabling the sharing of knowledge among all scholars involved, is also concerned with sharing results with the public at large.